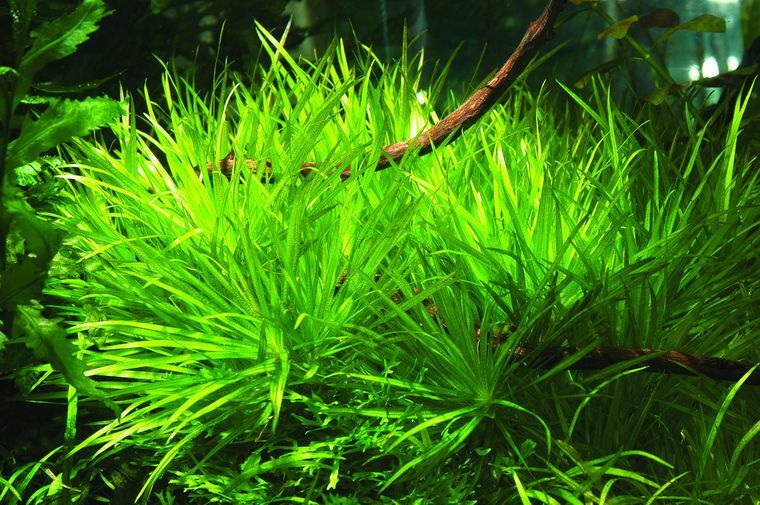 Blyxa japonica is a great plant for aquascaping. 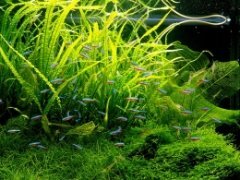 It is not very demanding, only needing moderate light and CO2 injection, and it forms such beautiful grassy effects. 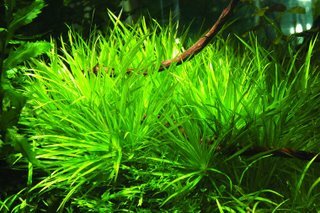 Widely used by Takashi Amano in his nature aquariums, this plant prefers acidic water. It is in fact, not a grass-like plant, but a stem plant with a tiny distance between leaves on the stem, creating a look of grass. In higher light, newer leaves will turn a goldish-red color. This can be one of the most frustrating plants to get rooted however, as they are very buoyant and are slow to grow roots to hold themselves in. Once you get a few plants rooted though, they will grow new shoots out of the base which can be trimmed off and replanted to propagate the plant. It appreciates a nutrient rich, fine substrate since it is a heavy root feeder. It fits well in the midground or foreground of a larger aquarium and can even become a background in a smaller tank. The plant will get about 4-5 inches in height when mature. The best place to get this plant is either from another hobbyist or from an online plant retailer. It ships relatively well, provided it is packaged well since it is fairly fragile. Finding it at a local store is highly unlikely. However, I highly recommend this plant for its aesthetic beauty and easy care.